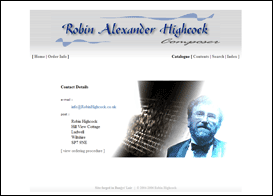 RobinHighcock.co.uk is a data driven PHP coded site, displaying musical scores, offering mp3s music files and information about the pieces written by the composer Robin Highcock. This was another project where creatively Bunjys' Lair had free reign, and as always for benefit of visitors we endeavoured to keep things simple. All graphics developed in Bunjys' Lair. Behind robinhighcock.co.uk lies an extensive admin area, that offers the facilities to maintain the database of music and manage the upload and deletion of the associated files. The site has recently been updated to work with 'Scorch' a sibelius browser plugin that allows sibelius music files to be played through midi whilst simultanously displaying the score music sheets through the web page.